The word “Road Safety” is the current buzzword in all over the world and everyone seems to be aware and concerned about it. With the number of increasing vehicles every day, accidents and mishaps are multiplying in number. This is why new technologies are getting invented every day to make sure everyone is on road remains safe. A rearview backup camera is to do the same, ensure your safety while you are driving. Even in the US, all the vehicles that will be launched in 2019 are said to install the rear view backup camera mandatorily. If you do not want to invest in a new car, you can buy a backup camera for your existing car and install it easily. How to choose the Best Backup Camera for Your Car? Currently, backup cameras are in real demand and therefore so many companies are launching their product. Backup cameras are available with different features and ranges like view angle options, Image quality, adjustable view options, reverse/mirror image functions, waterproofing options, wired/wireless and so on. Wireless backup cameras can be installed very easily as you do not have to spend time and money for the cable adjustments which will be going from the rear camera to the front monitor. The big question here are some points to remember before buying the best backup camera that will feature rich, good without making a hole in your pocket. Backup cameras are purchased for safety. Therefore, the first feature to be looked at is image quality and reversible/mirror image option. Mirror or reversible cameras show the exact view of the backside if the driver would see it manually. The camera should be night vision. The camera should have wide angles for accurate images. The monitor should be at least 4.5 “ to see clear vide. The camera should be DIY level easy to install and easy to use. 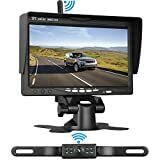 TVIRD Backup Camera and Monitor Wireless Car View camera system are one of the best available and hence making in our top 10 list. TVIRD backup cameras are night vision and waterproof cameras and help backing cars and trucks in heavy rainfall and dense fog. It comes with 4.3″ TFT LCD high definition monitor that has high color contrast. The camera has 7 LEDs and a wide range of viewing angle of 120 degrees. It has an accurate distance scale line display that helps in accurate distance measurement for parking to avoid collision and scratch backward. A key feature of TCIRD Backup camera system is it a stable wireless system with a signal range of 45 foot. 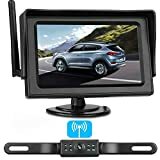 The TVIRD Backup camera Monitor Care view camera system is suitable for most of the vehicles like cars, caravan, trailers, campers, RV, box trucks, buses, 5 wheels etc. Most of the customer reviews are positive and customers are satisfied with its functionality. The camera comes with 4.3″ foldable color HD LCD monitor parking kit for bigger vehicles like trucks, caravan, trailers etc. 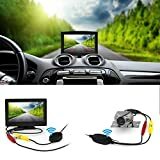 Pofodo Wireless Waterproof Vehicle Backup Camera is a very good backup camera that comes with 7” TFT LCD full color and high contrast monitor. The monitor is wide and has a built-in wireless receiver. It comes with 18 infrared LED for better night vision experience. The camera is waterproof with a built-in wireless transmitter with the frequency of 2370 MHz and a transmission range of 26-50 ft in normal weather conditions. In open plain roads, transmission range is 40 ft – 100 ft if there is no signal interference. Monitor has two video inputs, one is for reverse view through camera and other is for general entertainment like playing DVD etc. The camera is an IR reverse camera with a sensor that helps switch on the monitor automatically when the car is backing up for parking. 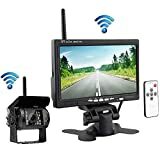 Pofodo wireless waterproof vehicle backup camera comes with 7-inch car monitor, 2 antennas, 2 power cables, 1 remote controller, 1 mount bracket and an easy to understand user manual. More than 50% positive user reviews have found for this camera. But, according to some customers, the camera stops working after experiencing some heavy moisture and rainfall, there were some other complaints about wireless range and quality of the images produced in the monitor. Another amazing wireless backup camera system and monitor kit from GOGO Roadless. 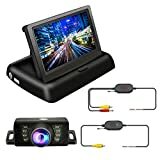 It is a rear view camera with 5” TFT LCD monitor which automatically starts when you back up your car displaying video which is captured by the rear view camera. It comes with 2.4G wireless RCA color video receiver which has a signal range up to 100m in normal weather conditions. The camera has the wide viewing angle of 170 degrees and is suitable for large vehicles as well as smaller vehicles. The backup camera comes with 5 inch LCD monitor, cables – video and power cable and wireless video transmitter and receiver. Majority of the customers are satisfied with this product. But the major cons for this product is it does not support any audio and it is not mentioned anywhere either. Also, there are complaints about installation manual. But there are no complaints found for the actual camera and monitor functionality and overall it is a satisfactory product. LeeKooLuu Backup Wireless Camera comes with 7” TFT monitor and is suitable for heavy and large vehicles like trucks, vans, trailers etc. The camera is an HD camera that has an IP68 license plate and 150 degrees wide viewing angles for smooth reversing and parking of those heavy vehicles. It has 18 LED night vision to capture video clearly at night to avoid collisions on highways. The monitor can be charged from any charging input like radio, cigarette lighter or fuse box or even reverse lights. The camera is waterproof and lightweight. The monitor high quality of image output and a high color contrast ratio of 100:1. 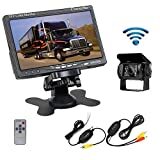 LeeKooLuu Backup Camera comes with a package of 1 power cable, 1 TFT monitor, wireless transmitter, wireless receiver, and a handy user manual. It has good reviews, though some customer found issues with durability of the component. The rear view Emmo backup camera is quite a good option for those who are looking for a backup camera for their vehicles. It is a wireless camera with a video signal transmission of 2.4 GHz radio frequency range and input voltage of 12V DC. The camera comes with CMOS image sensor, 420 TV Line resolution and it is a waterproof camera. The monitor can be powered very easily from in-house inputs like radio/fuse box, cigarette lighter or running lights circuit. It has two video inputs, one is for real view of the camera and other is for from side camera to provide you more comfort while driving. The color HD camera with a wide viewing angle of 135 degrees, and 7 LED lights IR for a good night vision capture. Overall good reviews on product experience from users though there is some issue have been reported for the quality of images and user manual. Amazing rear view camera for Auto Vox has made it to our top 10 because of its amazing features. It is a camera with a 6 LED which is high brightness for a great night vision option to keep your vehicle safe and scratch free at night. Each LED had 26 Lumen LED which adjusts their brightness according to environmental light. 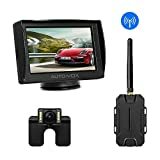 The key unique feature of this camera is its strong and reusable adhesive based car mount, by which you can mount your camera on the dashboard and the windshield. It has IP 67 waterproof transmitter which is suitable for any small or large vehicle. The camera system can be installed very easily. Majority of great customer reviews are there for this camera. ZSMJ wireless rearview backup camera is one among the top 10 finest backup camera for your car. It has a wide angle of 135 degrees and 7 infrared LED to ensure overall security of your vehicle in day and night and everywhere. The package includes the camera, 2 power cables, 1 wireless receiver and transmitter. The camera sends output that is displayed on high resolution and high contrast HD monitor. The monitor has auto startup option while you are reviewing your car. It has a wireless RCA video transmitter with a transmission range of 30m. The monitor is a 4.3″ TFT monitor. Good customer reviews with a very little complaint about the functionality of the package altogether. It is a good product to invest on. Camacho Professional backup camera system is amazing for all your vehicle rearview camera needs. It has 3 in 1 7″ TFT LCD monitor, a wireless unit, and night vision heavy duty camera. 18 LED lights for optimised experience at night. The camera is a hard metal case which is waterproof and mud proof and perfect for heavy rainfall or foggy weather conditions. The camera has 140 degrees horizontal view angle and 120 degrees vertical view angle for the perfection of rear view when you are backing your vehicle. It comes with a 30-day money back guarantee which is awesome and builds customers trust. Wireless transmitter has a transmission range of 20-40 ft, in normal weather conditions with 3V to 35V voltage. The monitor has the option to get mounted on the roof or on the dashboard. Also, the monitor has high color contrast with HD picture quality which can be rotated horizontally or vertically. Customer reviews are great for product and majority of the customers are satisfied with the service of the Cemacho pro backup camera. Here comes the best wireless night vision backup camera from LeeKooLuu with a 7″ TFT Monitor and 9v-25 V high voltage. The camera is water and mud proof with 7 LED IR Light and 135-degree viewing angle. Wireless transmission signal distance is 45 degrees. The monitor is lightweight with two voltage inputs and can be charged from any in-house power inputs. The monitor will be turned on automatically when you’ll back up the car. The monitor has HD, ultra-color contrast for very good image quality. It comes with a package that includes a 7-inch monitor, backup camera, wireless transmitter and receiver, easy to interpret user manual. It has got very good customer reviews. It has all the features to become your favorite backup camera. If you are looking for a good, feature-rich wireless backup camera kit, you have now the guide. Look at the functionality, features, and warranty of any backup wireless camera to choose the most optimized camera for your vehicle. Happy Buying!